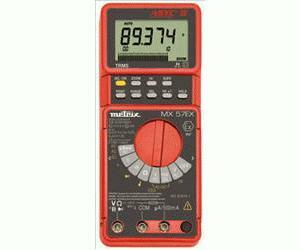 The Model MX57EX TRMS is an intrinsically safe digital multimeter designed for use in dangerous or ­explosive atmospheres. This meter is considered as a passive device ­without inductive or capacitive issues that are problematic in dangerous or explosive environments. This meter provides high functionality in a unique case designed for enhanced safety, reliability, ease-of-maintenance and protection from contaminants.